Lama Zopa Rinpoche was born in Thami, Nepal, in 1946. At the age of three he was recognized as the reincarnation of the Lawudo Lama. After fleeing Tibet in 1959, Zopa Rinpoche met Lama Yeshe, who became his principal teacher. The Lamas began teaching Buddhism to Westerners at Kopan Monastery in Nepal and eventually around the world. They also cofounded Tushita Meditation Center in Dharamsala, India. 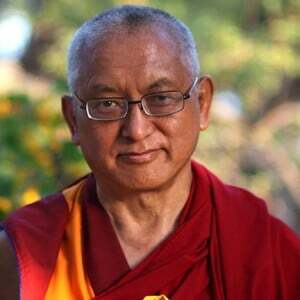 Lama Zopa Rinpoche is the spiritual director of the Foundation for the Preservation of the Mahayana Tradition (FPMT) a worldwide organization. He is also the author of numerous books published by Wisdom Publications, including The Door to Satisfaction , Heart Advice of a Tibetan Buddhist Master , and How to be Happy . Read Lama Zopa Rinpoche’s thoughts on the Abbey. View photos of his visit.